I started listening to Australian multi-intstrumentalist Xavier Rudd in the spring of 2010. Songs like “Time to Smile” and “Energy Song” became instant summer anthems. Rudd has performed at the Winnipeg Folk Festival several times early in his career, and as such he loves to return to Winnipeg. Sasha and I went to see him perform at the Burt, which we really enjoyed. 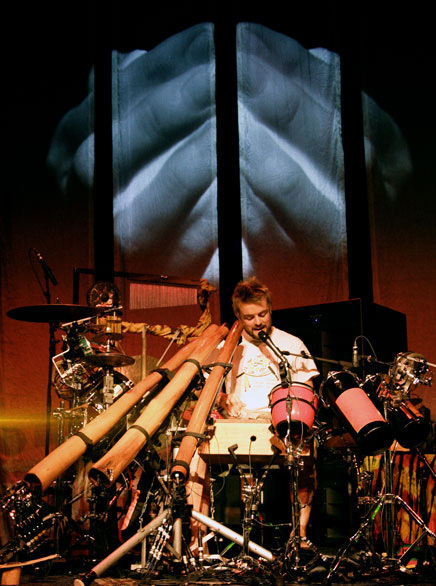 Rudd is famous for playing the didgeridoo and another instrument at the same time during his live shows (i.e., with hand drums, with guitar, etc.). On stage he’s typically surrounded by a multitude of instruments and didgeridoo pipes. He’s also a fantastic player of slide guitar, which is one of my favourite instruments to listen to. Rudd has just announced that a new album, Spirit Bird, will be coming soon. Xavier Rudd’s songs span a range of emotions, from dark to melancholy to summery to celebratory. His music blends roots, folk, and rock with Australian and African musical traditions. Rudd’s lyrics often deal with social justice and environmental issues. I think his laid-back musical style and socially conscious lyrics make him an excellent artist to listen to on a Sunday morning. Below is “Sky to Ground,” the opening track from his most recent album, 2010’s Koonyum Sun. I love the lyrics in this song. They evoke a delicate balance of wonder and activity, achieved via descriptive contrast. Enjoy!